This 11" long and 3.35" wide continuous 2 track non-linear Tortoise & Hare template is designed for use with a 1/8" standard drill. Each track has two starting holes, 120 playing holes and their own finish hole. 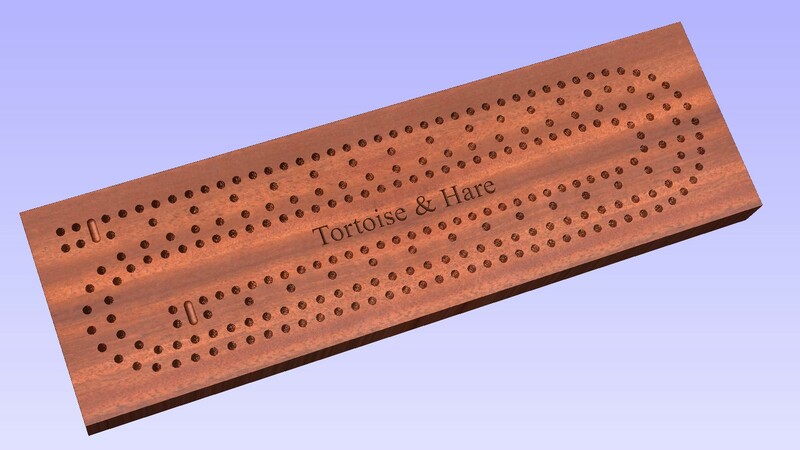 The Tortoise and Hare is a novel, non-linear board and is my own invention. It's continuous, spiral course is the full 121 holes but that's where normality ends. The holes for one player start off close together then stretch out. They take off really slowly, like a tortoise, sometimes a lap or two behind, then catch up really fast at the end. Of course their opponent has the opposite experience. They take off like a hare, really fast and are soon laps ahead. But towards the end, they hardly move at all. In fact, it's designed to be hard to see who is winning at all, changing the bragging dynamic of the game completely. Need something unique you can guarantee they don't aready own? Want to surprise your playing partner? Try the Tortoise and Hare! This is a downloadable electronic file for making a paper template. Once ordered, your email receipt will include a download link for you. To use, simply print out a copy in the size you require, temporarily stick it down to the wood, then drill through the holes marked. The file is in Adobe Acrobat .pdf format. You will need a .pdf viewer to open and print it. There is a free guide to downloading, printing and using our templates above in the additional info area. These files are available in electronic form only. Nothing will be sent by mail. These templates are provided for your own personal use only, and not for commerical use. They are also not to be resold under any circumstances. By purchasing and downloading a file, you agree to these terms and conditions.